22 February 2016, at 6:00a.m. MEXICO - The average slaughter price during the first weeks of 2016 is still going down, which started at $23.50MXP/Kg and at the end of last week (February 12th.) 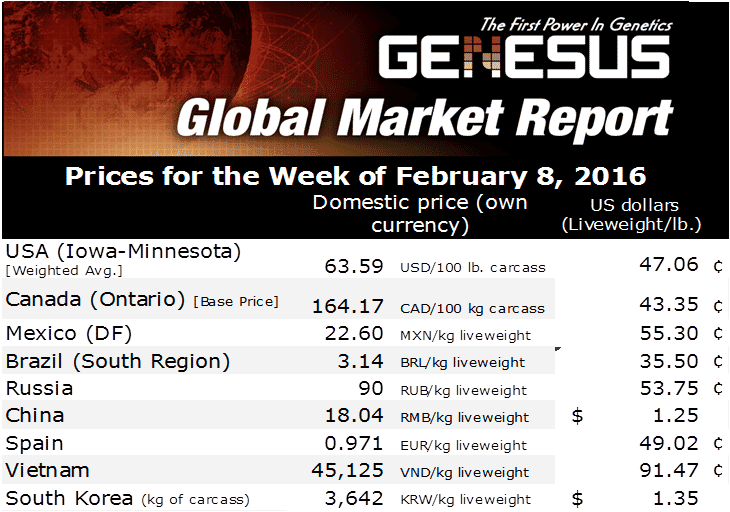 finished at $22.67 MXP/Kg (-3.53%), writes Carlos A. Peralta – President Genesus México. The Mexican Peso:USD exchange rate during January finished at $18.6317 MXP: $1.00 USD. Slaughter price that is being obtained is $1.2613 USD/Kg or $0.5680 USD/lb. as an average and, during the first 12 days of February the average exchange rate moved to $19.2450 MXP: $1.00 USD, reaching $1.1780 USD/Kg or $0.5306 USD/lb., (-6.6%). The exchange rate at the end of last week finished in $19.6280 MXP:USD. Historically the imported slaughter Price has been equal than the average National Mexico City Slaughter Price. February 10th, started the Season of Lent/Easter and during this period of time (40 days) the National Slaughter Price drops dramatically due Catholic Religion customs and habits linked to almost zero red meat consumption. The actual average Pig Industry production cost (Little variation between regions) it is about $21.50 MXP /Kg ($0.503 USD/lb. ), so the operational Gross Margin has been of $0.06 cts/lb. or $6.94 USD/liveweight (255 lb.). What happened with the supreme slaughter Price in Mexico´s different regions? 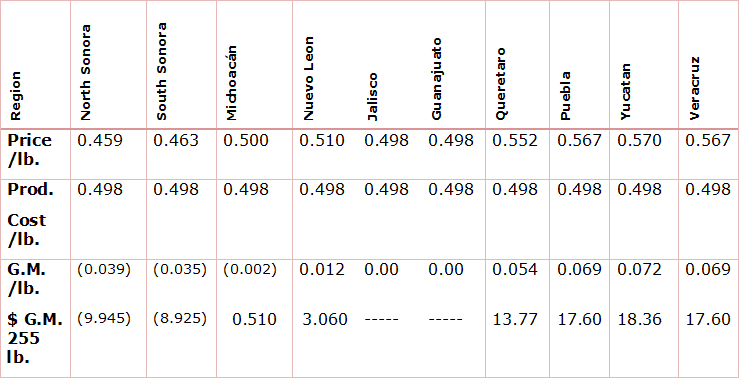 As you can observe with the information presented in the previous chart, from the 10 geographical regions in the Country, two of them are losing money (20%) (North and South Sonora), four of them are in breakeven point (40%) and four of them are making profits (40%). In general term the scenarios for the Mexican industry is not optimistic. According with the previous years, we estimate during the Season of Lent/Easter the slaughter Price could drop between 10 to 15% more. The slaughter rising prices will start during the first days of April. To continue with not good news, we have had several PRSS and new PED health outbreaks in most of the Mexican regions. This situation could be partially positive for the third quarter of 2016. This week Pope Francis will visit Mexico and with his blessings we hope to help us to improve the slaughter price.